Apparently the genesis of Christoph Marthaler’s Bekannte Gefühle Gemischte Gesichter (Known Feelings, Mixed Faces) lies in an earlier piece, Murx den Europäer! Murx ihn! Murx ihn! Murx ihn! Murx ihn ab! – the first piece that he made for Frank Castorf’s Volksbühne, premièring on 16 January 1993 and closing over a decade later in February 2006. [I say “apparently” because I didn’t know the first thing about the piece when I got tickets. I knew I loved a lot of Marthaler’s work; I spotted that there was a performance on my “day off” in Berlin last week; and we were lucky enough to get the last two returns/day-seats. So my primary experience of the piece was as a massive stroke of good luck; seeing this lovely, lovely piece of work almost as serendipity. If you’ve never seen a Chrisoph Marthaler show before, well, you should. He tends to work with the designer Anna Viebrock (read: never works with anyone else(?)). Her sets tend to be large “waiting room” type spaces. The forecourts of institutes; the insides of language labs; here, a large, high-ceilinged old museum, reminiescent of a school-room – grubby white walls showing where pictures once hung, dusty parquet flooring, and huge frosted skylights, through which Johannes Zotz’s remarkably evocative “naturalistic” lighting states pour. Apparently Murx... evoked something of the recently passed DDR, and it’s true Viebrock’s sets and costumes do always seem to hark back to an earlier time, somewhere indefinite between the 1950s and the 1970s. It’s worth saying, they still feel evocative of that past, even for me who never once set foot in the DDR. They still evoke the post-war British uniforms and overalls familiar in everything from the Carry On films to Open All Hours, the post-war architecture of (say) the Royal Festival Hall, right through to any office building or shopping precinct of the 1960s. Viebrock evokes the architecture and fashions of hauntology-land better than anyone. The other big thing about Marthaler’s work is that it is very often a kind of Devised Jukebox Musical. That is, he often seems to arrange a bunch of songs together, and then create a situation – within the Viebrock set – in which the cast sing them. This was true of his radically, radically deconstructed My Fair Lady (which introduced Wham!, DÖF and Wagner into Lerner and Loewe’s Shaw adaptation), it was true of Oh, It’s Like Home and King Size and even true-ish of his expanded take on von Horváth’s Glaube, Liebe, Hoffnung. 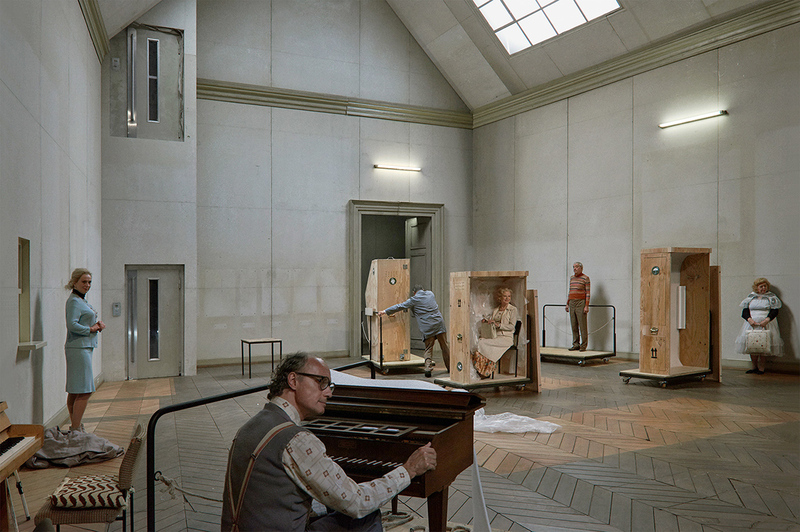 What happens in the piece is this: basically, a lot of mostly “old people” are wheeled onto the stage in various wooden packing crates, on trolleys under blankets, and in cardboard boxes. They seem to be exhibits in a museum coming out of storage. They seem to be singers or musicians – the chap wheeled in on the trolley under a blanket, with a spinet, is forever trying to sing and play some aria by (I’m guessing) Handel or Purcell. Once wheeled in, the (mostly) old people, essentially refuse to stay put, and the comic caretaker figure has to keep wheeling them out again, rearranging them, or trying to re-box them. It’s a comedy that often verges on the outright slapstick (which – cf. Herbert Fritsch – I normally loathe, but, as always with Marthaler, often find just about the funniest thing I’ve ever seen). The music here (as ever) seems amazingly chosen, and dizzy-making in its width and breadth of references and styles, all re-orchestrated, mostly for piano and voice(s). There was less pop music that I recognised, and indeed, less classical music that I actually recognised too, which (cheap, I know) does make a show different to those where you recognise the stuff. I imagine that the rest of the (German) audience did much better than me and knowing what things were, what they might mean, and how they resonated. Certainly, I’d never heard Ernst Busch’s Brüder zur Sonne, zur Freiheit before. I daresay most of the Volksbühne’s audience had. [Incidentally, re: that song – as well as writing revolutionary workers’ songs, Berlin’s (and indeed Germany’s) most important theatre school is named after him. Effectively, imagine if The Internationale had been written by Mr Rada.] In a way, it’s those historical threads which weave through the piece that makes a similar piece in England impossible. The Volksbühne on Rosa Luxemburg Platz run by ex-DDR director Frank Castorf is a phenomenon irreproducible in Britain, and, now also in Germany. That this show is part of the season that sees the sun set on such a remarkable administration, it is remarkable not only for how moving and tender it is, but also for its good humour and lack of bitterness.